Promotional campaigns produce a positive psychological effect by rewarding purchases. Offering purchasers the opportunity to get a discount makes the consumer feel rewarded and gives them confidence in your store. 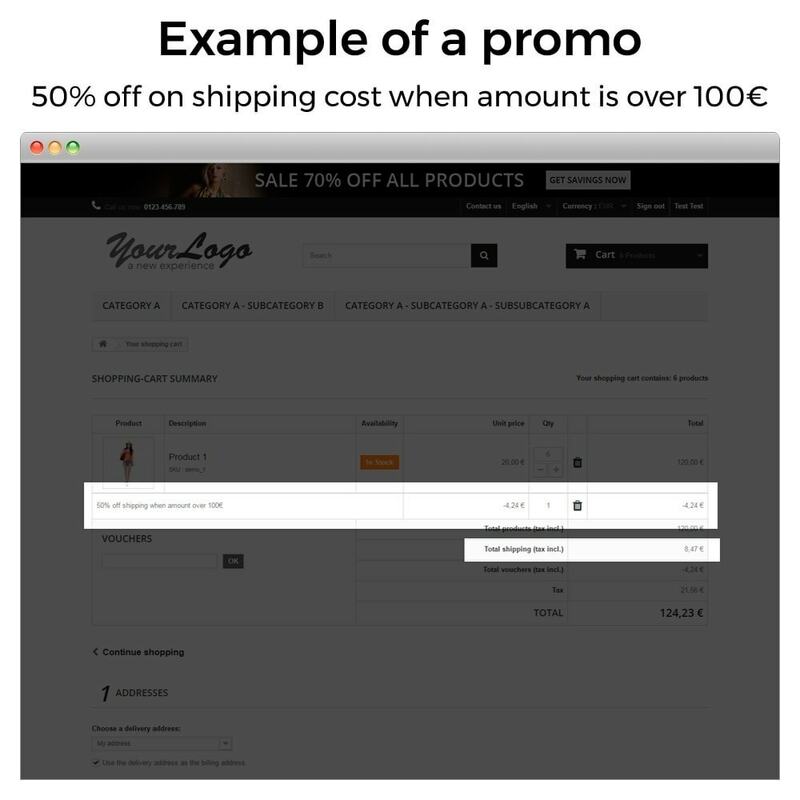 Incentivise your client’s first purchase with a special discount or free shipping on their first order, for example. 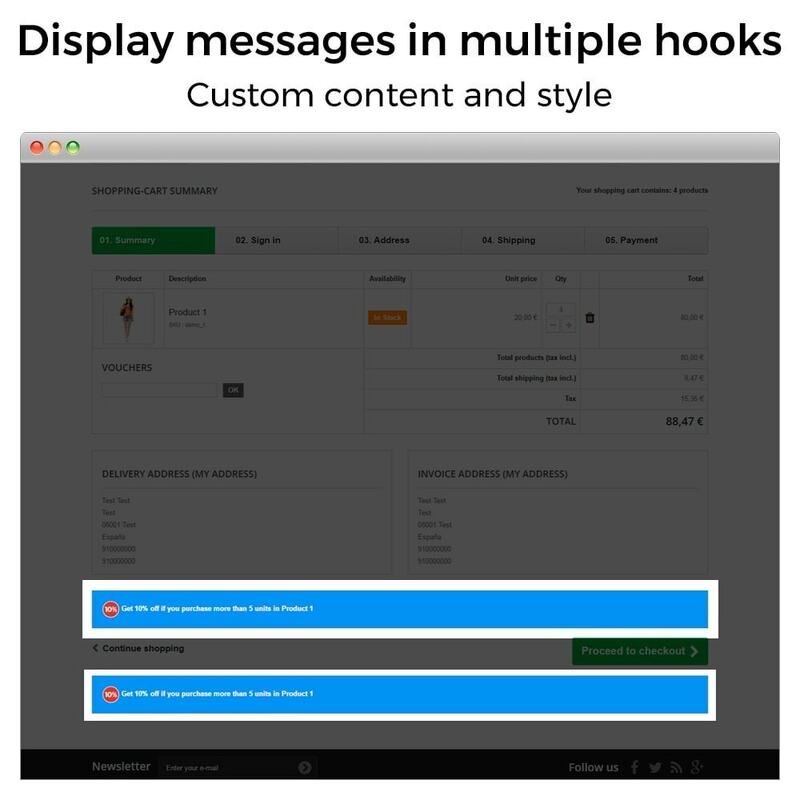 Break the psychological barrier of mistrust and lack of awareness between the client and your store. Use the information in your clients account to find out what clients want. 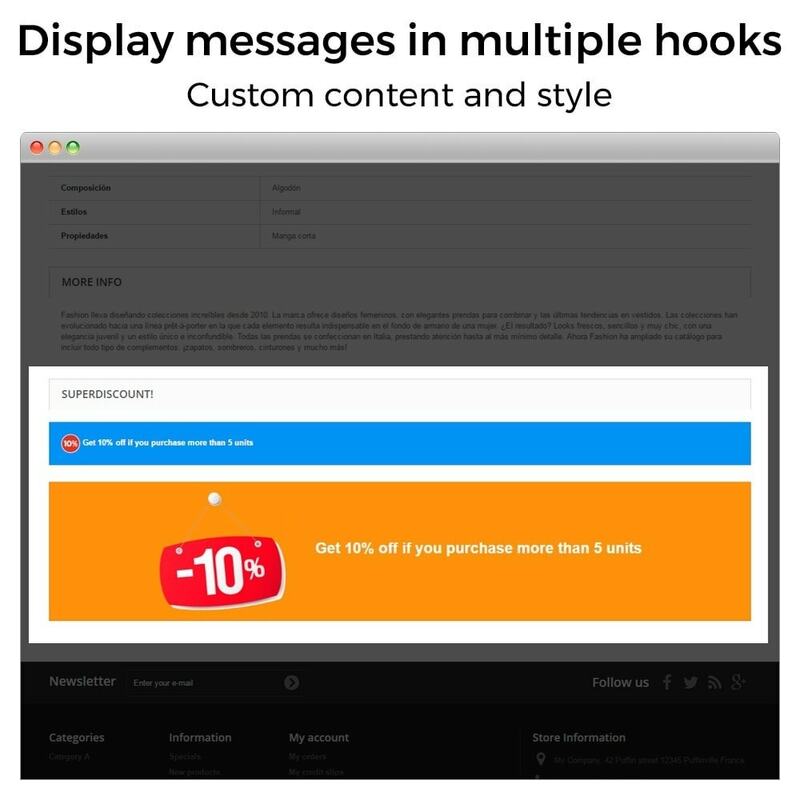 Create special offers based on the order history of clients who have fallen in love with your store and return regularly. Offer a product pack promotion, combining the star products from your store with less popular products to increase the amount in the shopping basket. Provide exclusive offers to your clients to show them that they are even more special to you. Today, this is essential to obtain client loyalty. 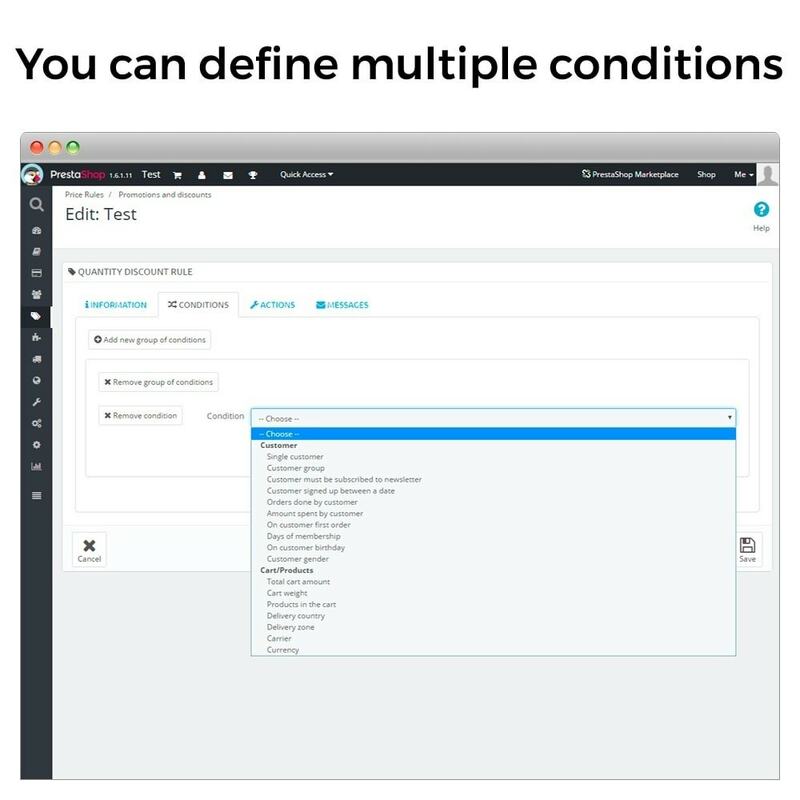 Specify the number of sales or the number of orders in the conditions. That way you can have offers like “10% discount for clients who have made 2 or more orders” or “discount of €100 for clients who have made orders worth over €5.000 in the last 6 months”. 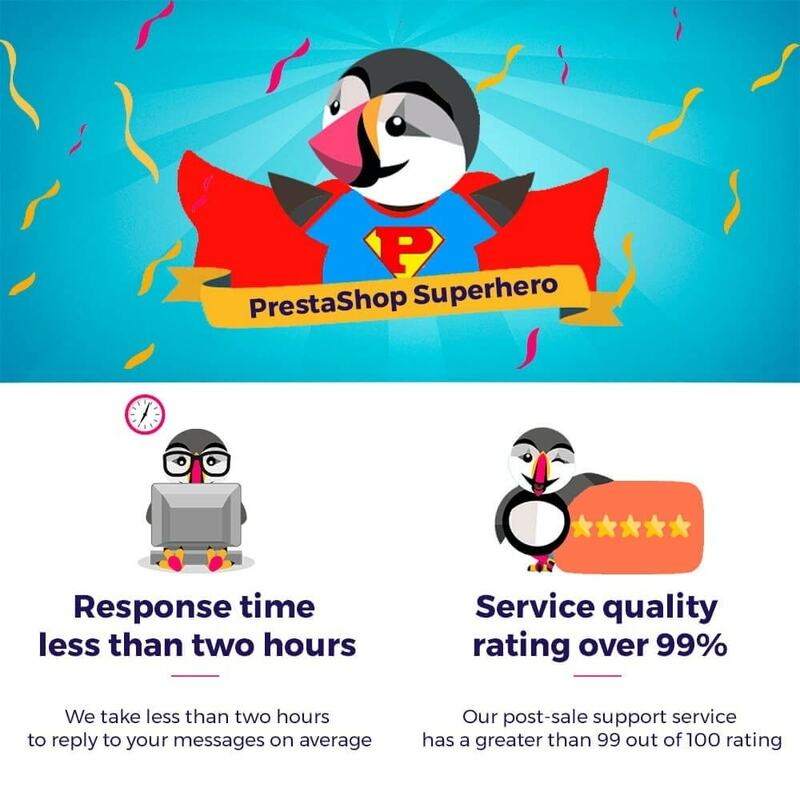 This will motivate clients to return regularly to your store and make more orders so that they receive a greater discount. You can offer discounts only to clients who have made more than a certain number of purchases or that have spent more than a specific amount on previous purchases. Offer your clients a discount if their shopping basket goes over a certain amount, if they buy a product from a selected category, etc. This way, your clients will spend more to get the discount! You can exclude items with a specific price from your discounts. Those items are already discounted as much as possible, so you can configure the discount rules to exclude them and so you don’t lose money. Have your best campaigns on special dates, such as Valentine’s Day, Mother’s Day, and Father’s Day, Sales, Back to school, Halloween, Black Friday, Cyber Monday, Christmas, New Year, St Patrick’s Day, for example. 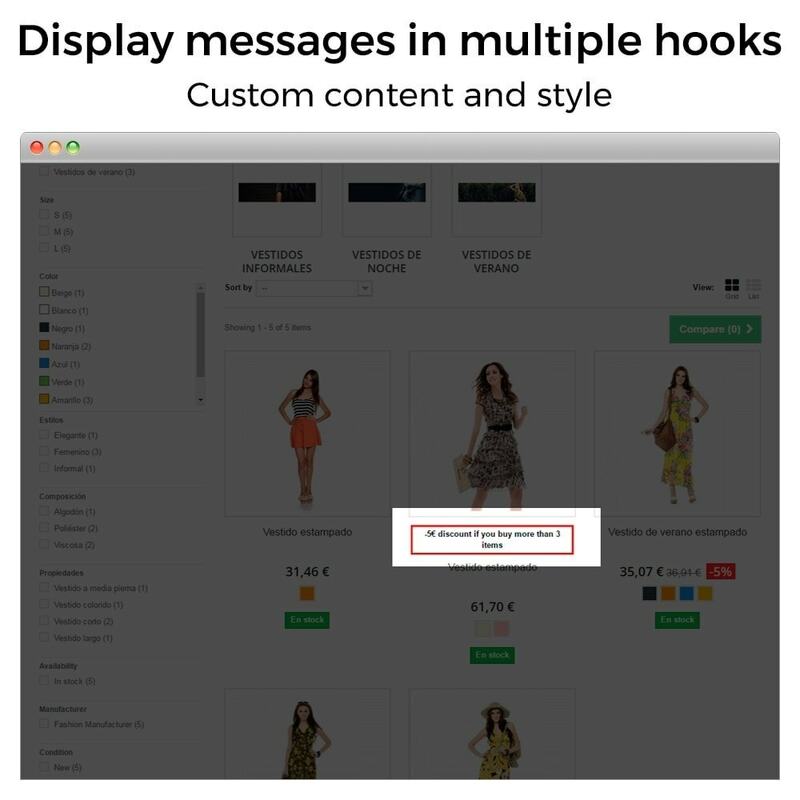 Take advantage of this module to promote the less popular items in your store or out of season items that you want to remove from your stock.. Offer a special discount for those items to attract your clients. 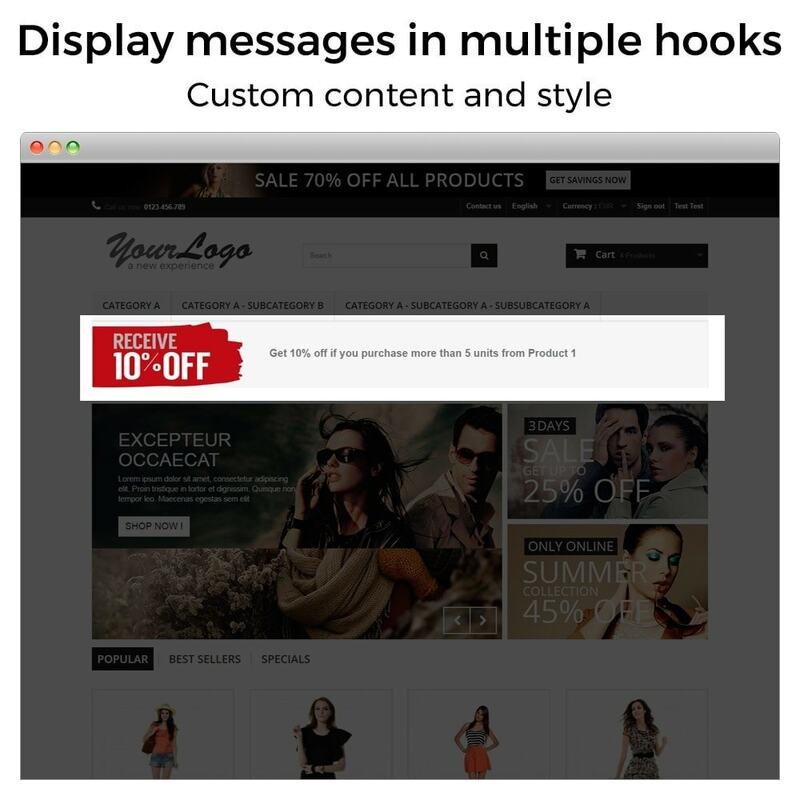 Inform your clients about special promotions with attractive banners and messages. 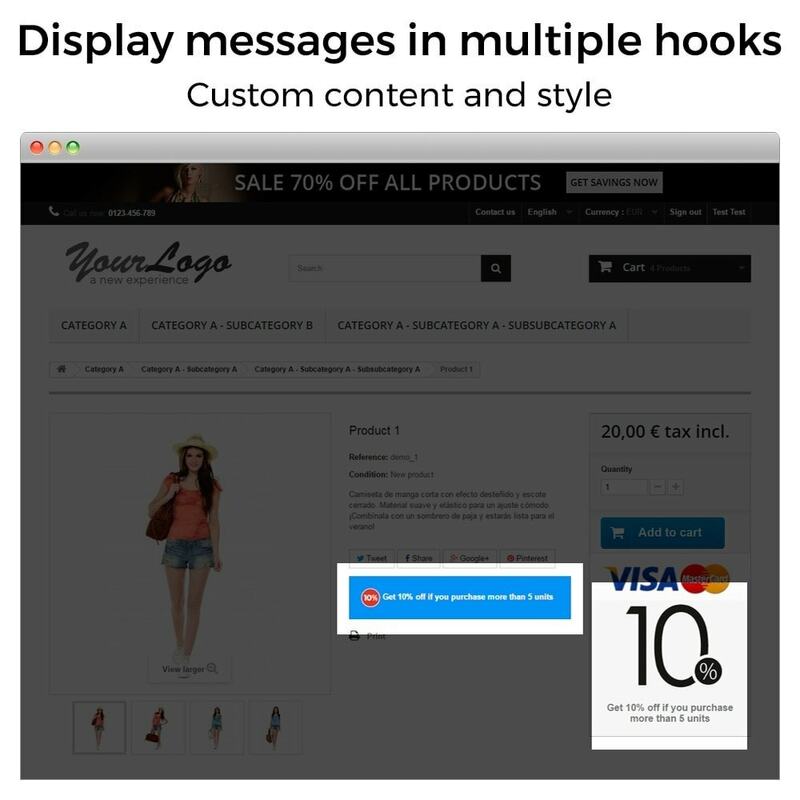 You can place these anywhere on your page, such as the home page, the product file, the category page, the shopping basket, etc. The discounts applied are a cost factor when considering whether to complete the purchase or not (as well as whether or not to return to the store :-). So the discounts breakdown should be shown in a way that makes it easy to understand, as the clients want to be sure that they are getting all the discounts they have been promised. You can define the price chosen as the basis for the discount: the price followed by previous discounts or the price of the original item. The module is 100% compatible with virtual items. So if your store has virtual items you can use all the functionalities. 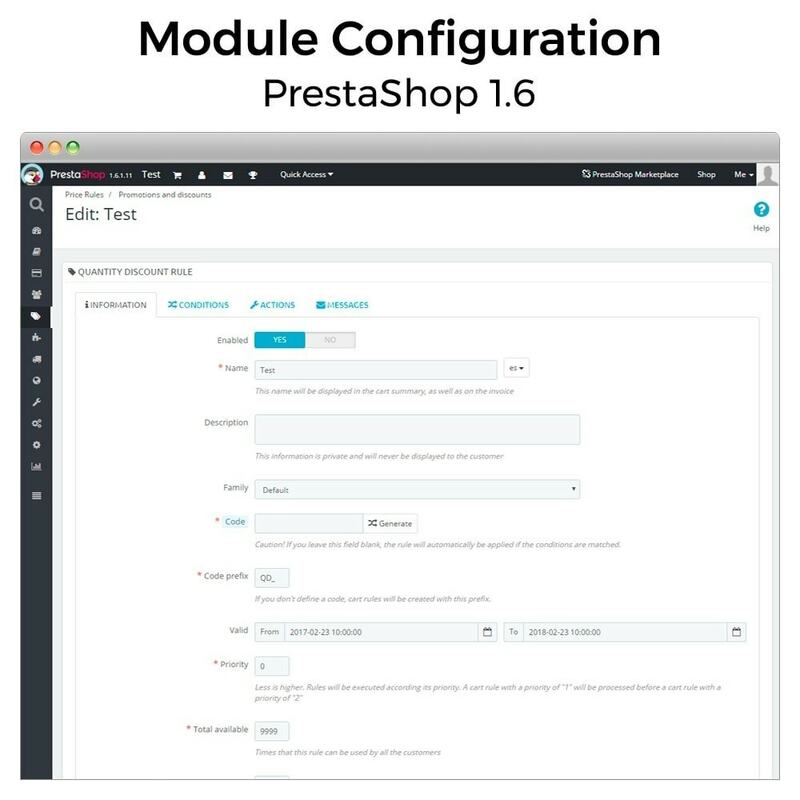 The definitive module for configuring promotions in your store. Configure any discount! 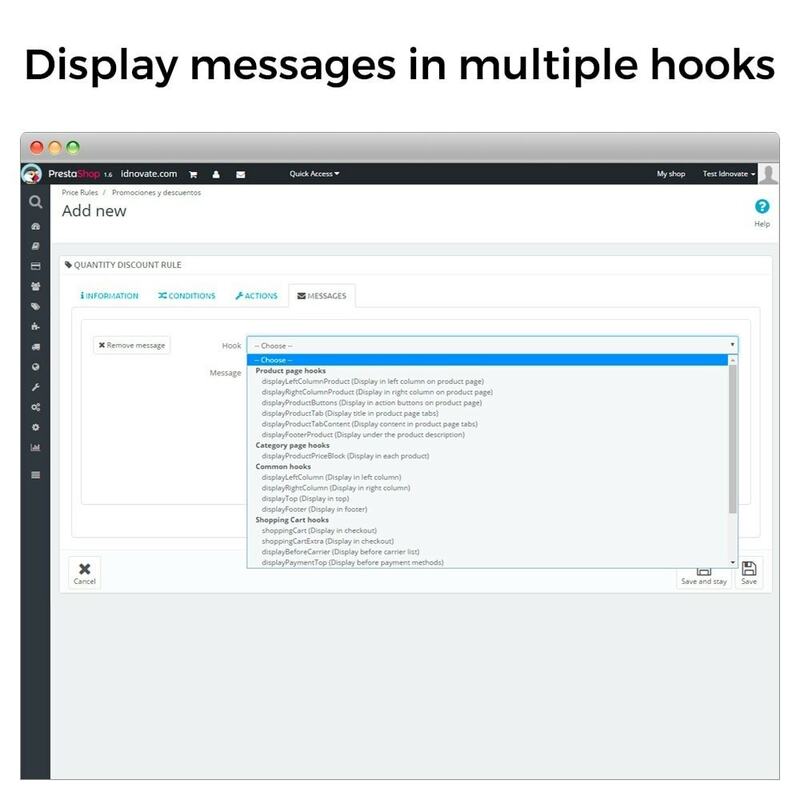 You can create almost any promotion imaginable!If you have any questions about whether you can configure the promotion you need, send us a message and we can help you. Elevate your store to another level with price and promotion offers! This module is what you need to achieve this. Create any discount with the cheapest and most expensive items. Forexample, you can create rules like "Buy one, and get the cheapest (or the most expensive) one free”, “Buy 4 items, and get the most expensive one at 50% discount”, etc. Discount the price of any item to a fixed value. Put a fixed price on items and get promotions like “Buy one shirt and get another for only 10€” or “All socks for only 5€!" 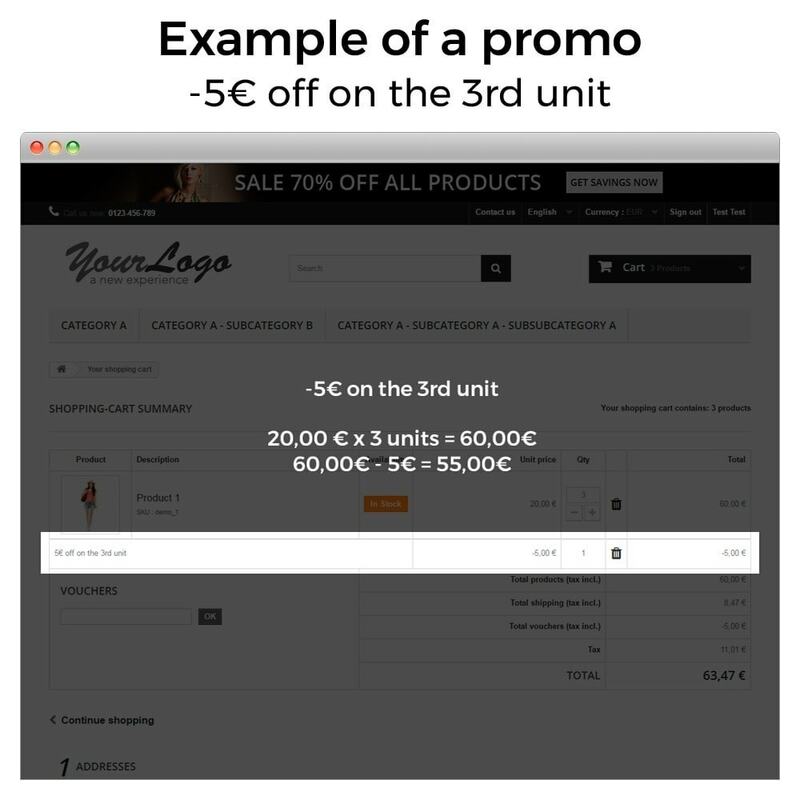 Create promotions like "a 30% discount for every second item (the 2nd, the 4th, the 6th)” or "get every third item (the 3rd, the 6th, the 9th) free”. You can make offers like: "Get one out of every five items free", "Buy 3 items from a specific category and get one of them with a 50% discount”. 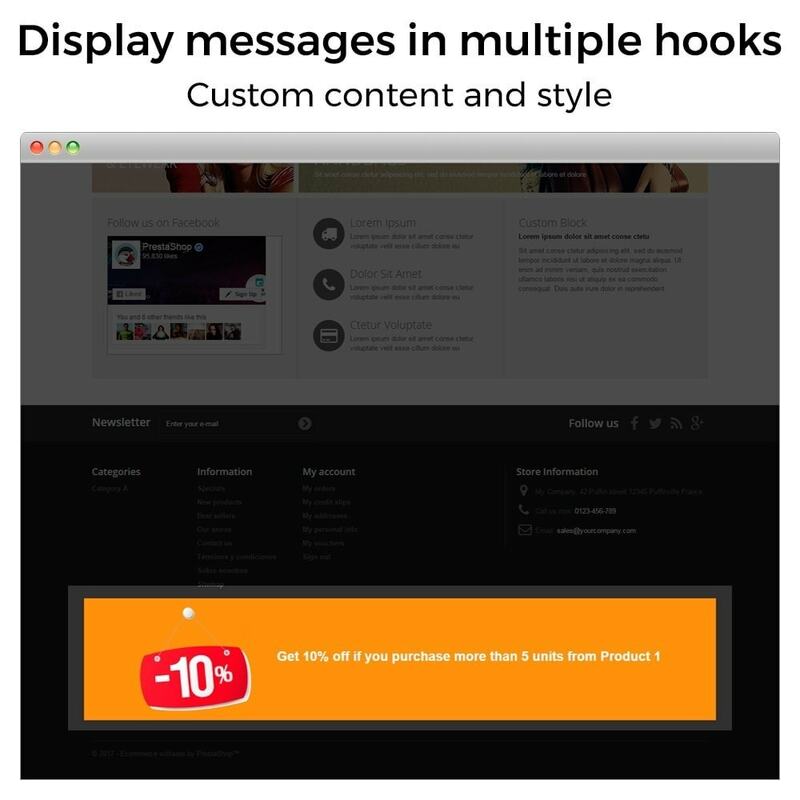 Create promotions like "Buy 3, 4, 5, etc. items at their normal price and, from then onwards, each item for €50 or with a 20% discount". You can configure it so that the most expensive items are charged at normal price and the cheaper items qualify for a discount, or vice versa. 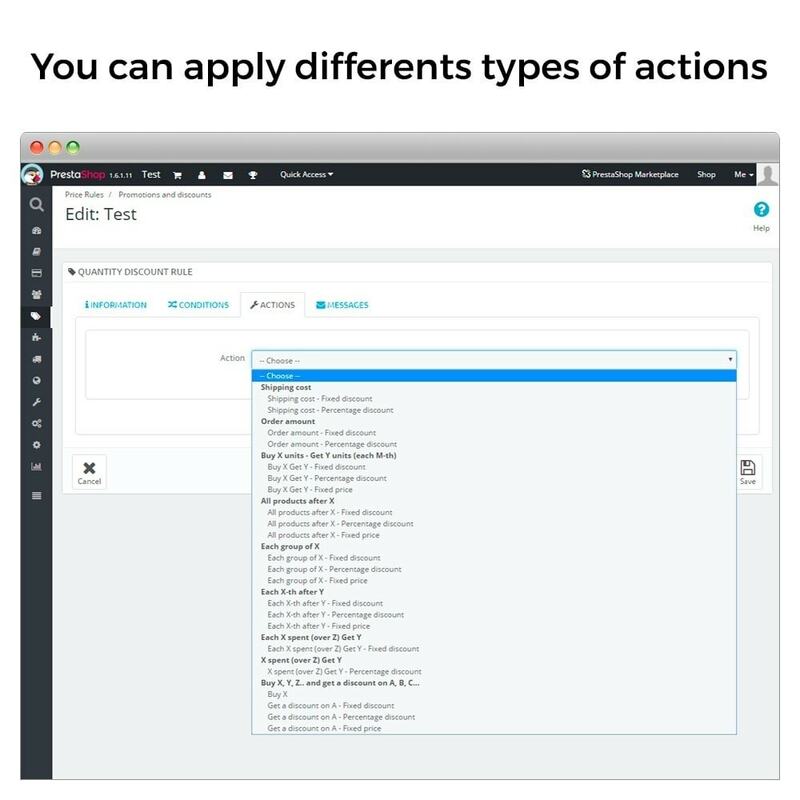 You can limit the number of elements to discount. You can create rules like "Buy 2 books at the normal price and get 2 more at 50% discount” or “Buy 3 bags at the normal price and any additional ones for 100€". 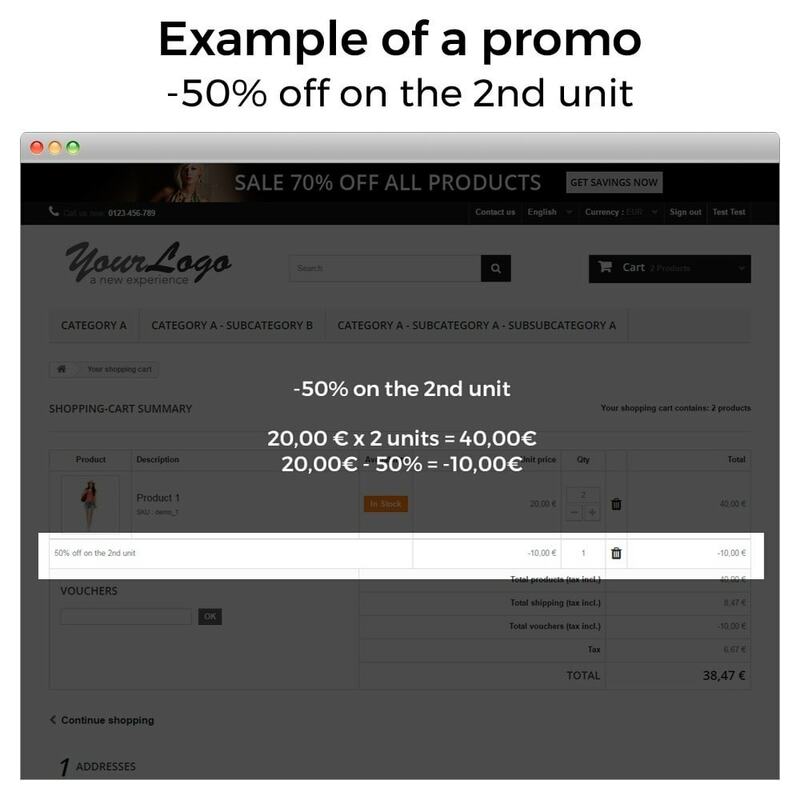 Create promotions like "Buy 3 items at the normal price and get a discount for every second extra item (or 3rd, or 4th, etc.) that you buy. Increase sales of items by cross-selling. 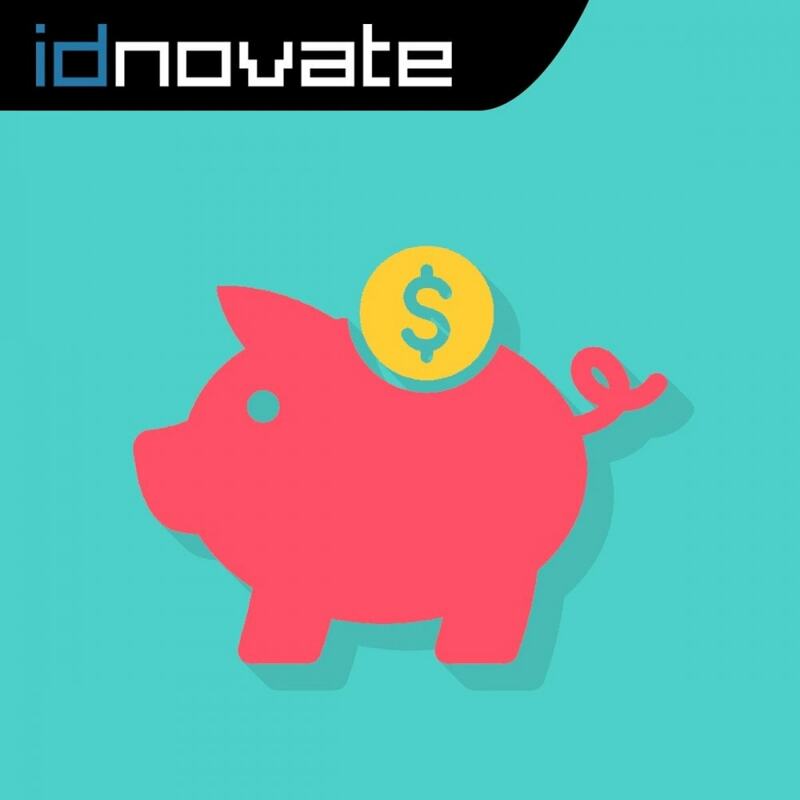 Motivate your clients to buy more! Create attractive promotions using offers with additional items at fixed prices, with discounts or free of charge. Configure promotions like "Buy X and get a percentage discount, fixed discount or fixed price on Y", or create offers like "Buy three shirts and get 50% discount on a tie", "Buy 2 pairs of trousers and get a belt for only 5€!" or "Buy 3 nail polishes and get a lipstick absolutely free!". Evolving discount rules. 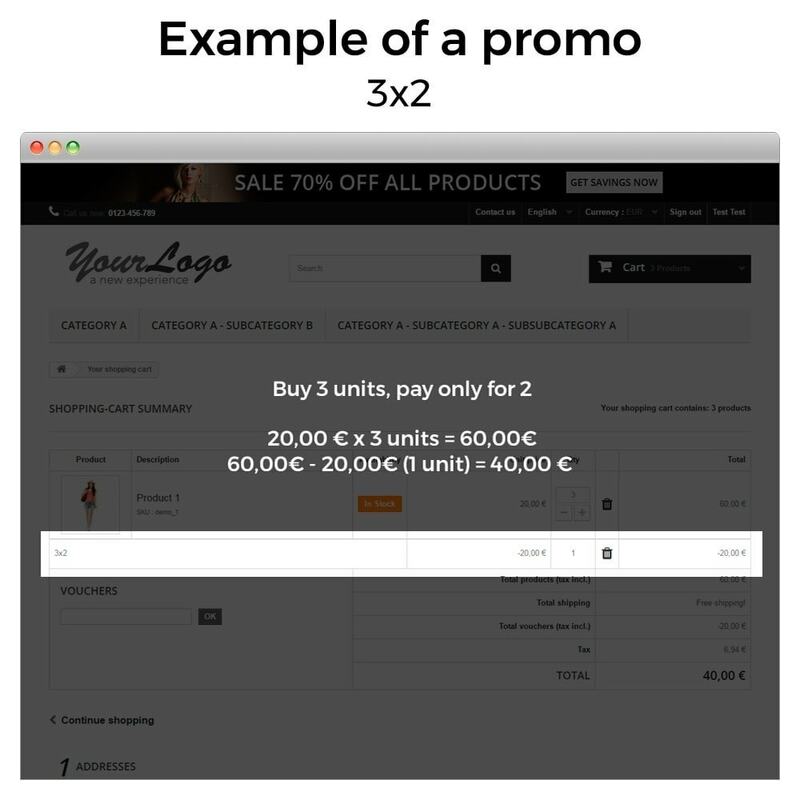 You can specify the quantity of free or discounted items like"Buy X and get N at Y with a percentage discount, fixed discount or at a fixed price” to create offers like "Buy a dress and get 2 bags at 60% discount", "Buy a kettle and get 10 cups for 10€" or "Buy a pair of shoes and get 3 free pairs of socks”. Buy a coat and get 30% discount on a hat. Buy a coat at normal price, or buy 2 at 30% discount. Add a pair of trousers to the shopping basket and choose any belt for only €25. Promotion “MxN”. Buy 9 items and get 3 free of charge (9x6). Promotion “MxN”. Buy 8 items and get 2 free (4x2). Promotion “MxN” only for selected categories. Buy 12 items and get 3 free (4x3). Buy 2 shirts and get any tie for 10€. Prices by quantity: Buy 1 unit for €100, if you buy 2, €90 each. Spend over €250 on category A items and get 10% discount on category Y. Buy 2 or more items from category X and get 10% discount on items from category Y. Buy 4 items from the selected categories and get free shipping. Spend over 500€ on selected categories and get free shipping. Get 100€ discount if you have accumulated €1,000 in purchases during the last 3 months. 10% discount for clients that have previously made more than three orders. Get 20% discount every 3 items. Get 10% discount on the 2 most expensive items. Get 20% discount on the 3 cheapest items. A discount of 5€ for all clients registered before January 2016. Buy 3 and get the cheapest one (or the most expensive one) free, buy 6 and get the 2 cheapest items (or the most expensive ones) free. All items in category X for €10. Buy 2 books and get a third book free (or with a 40%, 50% etc. discount). A €10 discount for every €50 spent over €500. If you spend €550, €10 discount. If you spend €600, €20 discount. Pack of items: Buy items X, Y and Z with a 25% discount. Pack of items: Buy items X, Y and Z at a fixed price. You can combine all the conditions that you need to create the promotion that best adapts to your requirements. The number of options is unlimited.